Our camp atmosphere is founded on principles of freedom and respect. First, we do everything we can to ensure that kids feel positive about themselves and others. Second, we create an environment that is overflowing with different activities. Although we introduce many of our activities in a structured manner, we want to provide campers the opportunity to focus on the activities that peak their interest. Those that are into art, for example, can spend a fair chunk of their time pursuing art. They don’t have to wait until the next formal art class. Our counselors are carefully selected based on their talents, commitment, athleticism and ability to excite young minds. Our philosophy of leading by example has helped us build an excellent team of hard working leaders. Many of our campers are eager to begin their training towards becoming a counselor and we encourage them to work towards their goal through respect, skill development, and helpfulness. Each of our counselors is required to undergo First Aid & CPR training. Every year, we plan a variety of field trips to enhance our camp experience. Swimming normally takes place on a week during the summer at a local community centre, and for a change of scenery we substitute for a lake trip and some beach time. Many of our trips are to various parks and conservation areas, but we also include a few trips to indoor facilities such as Sky Zone. If possible, we like giving our campers a choice of trips (e.g. mini golf or movies, billiards or bowling, swimming or skating, etc…). The extra effort goes a long way in providing each camper a feeling of involvement and independence. During the winter, we organize a skating trip and a trip to a ski hill. We strive to dazzle our campers with extraordinary meals and snacks. Lunch staples include Pasta & Meat Balls, Chicken & Rice, Sausage & Roasted Potatoes, Pizza, and a wide range of fruit and vegetable sides. Vegetarian options are available and we are able to cater our menu to nearly any dietary restrictions. Not every meal is made into a big deal. Sometimes we eat a simple breakfast or lunch to make good time before a trip. Sometimes our snacks consist of a granola bar or apple slices, but throughout the week we add a little extra something to peak our campers’ taste buds. Chocolate covered coconut, fruit smoothies, melon salad, and roasted pineapple with cinnamon are just a few of the tasty treats we like to surprise our counselors and campers with. At least once each session we will go all out, usually for breakfast. “That was the best breakfast I’ve ever had”, is a common reaction. Exercise is an important part of all our programs. During camp, each day starts with a fitness routine that helps kids understand the importance of daily activity, proper warm up techniques, and the physiology behind exercise. After a bit of time, our kids understand how joints work, how bones are connected, how muscles grow stronger, the importance of recovery to prevent tissue damage, the importance of flexibility, the difference between aerobic and anaerobic activity, and the function of the main muscle groups. We also encourage kids to discover the strength of their mind-body connection. As adults, we know that earning respect is not easy. We have to demonstrate courtesy, commitment, skill, and most of all, results. Usually earning the respect of others amounts to promotions, greater success, and ultimately a higher self worth. Our camp program aims at encouraging kids to earn respect by rewarding them for their positive effort and accomplishments. Campers get “Credits” for their helpfulness, good behaviour, skill development, project completion, and participation in challenges. Credits can be redeemed for a range of games and prizes. Our awesome selection is sure to capture the interest of even the pickiest child. When the weather doesn’t cooperate, we use our indoor space for floor hockey, soccer, volleyball, badminton, dodgeball, nerf tag, and tails (a game similar to tag that use velcro flags attached to a belt). Games are one of our specialties. Aside from all the traditional games like chess, monopoly, dominos, giant jenga, etc…, we also have a range of puzzles (dowdle puzzles, several perplexus mazes, tantrix, rubics, and other physical puzzles). 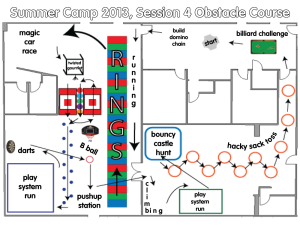 Beyond these basic games and puzzles, kids get to choose from an impressive range of game tables: billiards, ping pong, air hockey, foosball, water tables, different activity tables, 9 mini puck tables (our original spin off of crokinole/minigolf), and twisted gauntlet (our one of a kind giant sized marble maze). 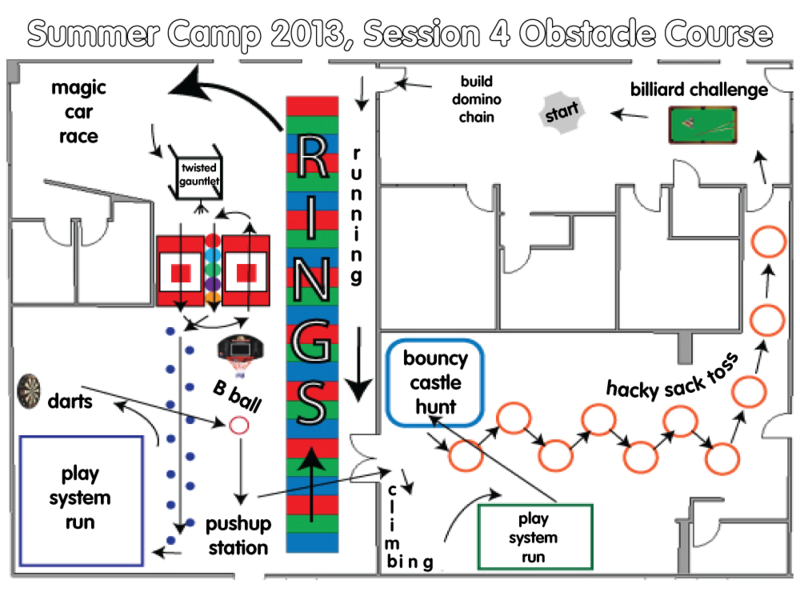 One of our personal favorite activities is the obstacle course. Over the years we’ve designed a lot of courses. They range in size from 2000 sq. ft. to over 5000. The creativity that goes in to our designs is nothing short of incredible. In order to accommodate more outdoor activities, we built a playground on the west side of the building. The playground is nearly 2000 sq ft and contains 2 sheds full of equipment. The playground is equipped with a water outlet, allowing us to set up a variety of water play activities.